My son and I are enjoying our time spent learning about the moon. love to learn about the moon. We have been reading some books about the moon lately (see end of post for three of them) and I have been working on some moon activities to accompany our reading. First I cut off one end of the salt container. In the opposite end I used an x-acto knife to cut 4 moon phases: new, full, half and crescent. I lined the full moon cut out with blue cellophane and the others with yellow. I then attached a circle with a cut out to the same end using a brad (you can see in the photo). At the reverse end of the container I cut a hole to fit a small flashlight, inserted and taped the flashlight in place (otherwise I knew Kiddo would push it into the viewer and we would have to take it apart to retrieve the light! I taped the end back in place and decorated it with construction paper and stickers. Here is a blurry photo of the full moon made by the viewer. But don’t forget to check out the real thing in the night sky. You could even keep track of the phases and recycle some of those old calendars at the same time with our easy peasy moon phase calendar activity. Check out all 5 of our moon activities. Hi! I'm not sure how I ended up at your blog–I've been sidebar-link-hopping this morning–but I think this project is awesome! And totally worthy of the Crafty Crow, too, by the way. 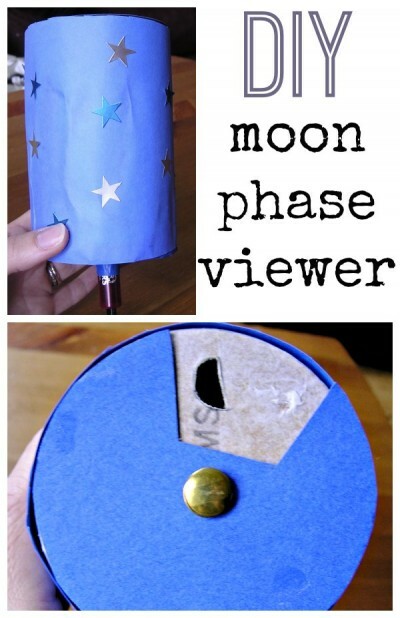 I've been wanting to make some sort of lunar calendar for my daughter and this is excellent! I've bookmarked your site! This is AWESOME!! Thank you for the great idea! LOL! You are too funny with that crafty crow comment! I LOVE this idea! It's fantastic. oh!!! this project is fantastic! we've been saving oatmeal containers for a star constellation project! but we will have to try this first! thanks for sharing! The salt container is simply a cardboard cylinder so any other cylindrical container would work.